Most standard rifle scopes are designed for shooting at motionless targets. Thus, when you are aiming at moving targets, a standard rifle scope might not do. This is where the best reflex sight comes in. 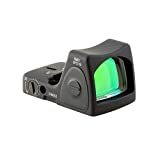 Built for fast target acquisition and aiming at unexpected targets these sights are popular with police and the army. Reflex sights can give you the kind of shooting experience you have been missing out on. That is if you have been using standard rifle scopes such as 22 long rifle scopes. Additionally, these types of scopes are usually light and will not add much weight to your weapon. The main reason you should get a reflex sight is the time it takes to aim and shoot. With this type of sight, you can aim and shoot almost instantaneously. Reflex sights are used by military personnel, in fighter jet gun systems as well as in naval gun systems. As such, these sights have many applications. In coming up with an article about reflex sights, I relied heavily on user reviews. Also, I did extensive research on the history of these sights and how they have been used over the years. This is in addition to relying on expert opinions. Therefore, if you want to buy a reflex sight, it is important you read this article to the end. By covering different aspects of buying a reflex sight, I intend to help you with the search and purchase process. While I do intend on reviewing some of the best reflex sights on the market, it is important I share with you the factors that led me to settle on the below sights. Below are the main factors I relied upon when choosing sights to place on this list. Note: If you have a glock pistol and want to buy the best sights for glock 43 then read the linked post. The first thing I look for whenever I am buying any kind of tool is the material it is made from. Therefore, the first thing I considered was how durable are different sights were. Irrespective of cost, a reflex sight should be durable and tough enough to withstand harsh weather like what we said on our best single pin bow sight reviews. In particular, I advise against buying a sight that is neither shockproof nor waterproof. The last thing you want is to buy a sight that will crack or get damaged after a few days of use. Reflex sights use batteries. Thus, it is important to consider the battery life of a reflex sight. Sights that use LED consume less energy and can go for up to 1000 hours. When choosing the sights for my list is considered each one’s battery life. When it comes to the housing, reflex sights can be divided into two open style and tube style. The category you settle on depends on your preference. Tube style sights are similar to optical scopes and allow for easy installation of protective covers. On the other hand, the open style has an open window design without any covers. In this article, I have reviewed both types. Accuracy is one of the most important factors to consider when buying a reflex sight. Since these sights are designed for rapid fire shooting accuracy is key. I relied on user reviews and my own personal experiences in evaluating accuracy. Sightmark is probably the company that comes to mind when you think about red dot sights. And the company added another sight to its enviable list of reflex sights in 2014. Dubbed the Ultra Shot M-Spec, this sight has quite the list of features. Since I am a big fan of the Texas manufacturer, I was probably one of the first people to buy this sight. I have been using it on my AR 15 since 2014, and I am more than pleased with it. And with a battery life of 1000 hours and digital switch controls, what’s not to love. Though I use my Shot M-Spec on my AR 15, I have used it on other rifles as well. And I am proud to say that it maintains its exceptional qualities even on a .50 caliber recoil rifle. Magnesium alloy housing: for a sight that is priced less than $ 200, the magnesium construction of this sight is very good if not great. The sight is capable of surviving everyday nocks and falls. 1X magnification: The 1X magnification, is perfect for close range shooting, which the AR 15 rifle is designed for. 2MOA dot: While this sight is great for close range firing, its 2MOA dot is visible from considerably long distances. It is waterproof and can survive being immersed in up to 40 feet of water. Considering its price tag and its features, this sightmark worth buying. Well if you own a AR 15 and are on a strict budget this is a scope that I highly recommend. I dare say it is the best reflex sight for ar 15. However, it is not only restricted to the AR 15 as I have found that it can be used on shotguns as well. When you have options such as the Sightmark M-Spec are pricier reflex sights such as the Trijicon RMR worth buying? This is the question is sought to answer when I tested one of my hunting buddies Trijicon RMR 6.5 sight. While its unique design gives it a rather premium look, it is the sight’s targeting mechanism I was more interested in. I tested this scope in different light conditions, and it performed exceptionally well. Largely thanks to its auto brightness adjustment feature. In regards to construction and weight, I found it to be very lightweight and very well made. The multi-coated lens looked brighter than that of my sightmark. While its price might be a turn off for some, but when you consider its features it is worth it. In particular auto brightness adjustment makes it ideal for tactical use. In fact, this sight is a preferred choice for many law enforcement agencies. Also, this sight is not limited to one rifle and can be used on shotguns, pistols, rifles you name it. Thus, for all intents and purposes, it deserves the title of the best reflex sight for the money. At first glance, it is hard to imagine that the Vortex Optics Sparc 2 Red Dot MOA costs less than $200. Its elegant design and sophisticated look make it look like a high-end sight from EOTECH or Leopold. Unlike other sights in its price tag, this Vortex creation boasts of an aluminum construction. And that’s not all, it is also compatible with an almost endless list of firearms, from AR 15s, AR 22s to the H&R 1871 shotgun. The lenses on this sight are exceptionally clear and offer plenty of brightness. In this regard, the scope works well in all light conditions. Aluminum construction: The aluminum construction is responsible for the 6.4 ounces weight of this sight. With such a weight you will not feel like you have added a sight to your rifle. Mounting bases of varying heights: The secret to the sight’s compatibility with a wide array of guns is this feature. With it, it is easy to mount it on rifles with an inline design as well as those with a lower comb such as AK 47s and shotguns. All things considered, this Vortex model is a great piece of optical hardware and deserving of being on this list. Not only is it reasonably priced, but it also has a premium feel and looks. But more importantly, it is very lightweight and durable and can withstand the occasional fall or nock. If you are looking for the best reflex sight for Glock 19, then you have found it. 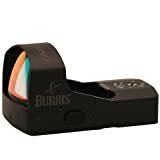 The Burris 300235 Fastfire is perfectly designed for handguns. You can choose between the no mount version and the Picatinny rail version. This sight is true to its name as it provides a quick target acquisition with exceptional accuracy. One of the things I love about this sight is the unlimited eye relief. There are many reasons why this sight made it on my list. However, the main is its construction. There are very few sights in the Fastfire’s price range that have a better construction. This Burris model is great for handguns. However, it can also be used on other rifles as well including shotguns. Additionally, it is very well priced and offers the kind of tactical precision and accuracy you would expect from high-end sights. Therefore, it is one sight that comes highly recommended by me. One of the lightest reflex sights I have ever used is the Vortex Razor Red Dot sight. Weighing only 1.4 ounces, this sight will add nothing to the overall weight of your gun. Apart from being one of the lightest sights on the market, it is also of exceptional quality. But what I really liked about it is its emphasis on protection. It takes more than normal abuse to get this sight damaged. Everything from its housing to its lens is constructed from high-quality materials. In particular, its housing is made of the same aluminum used to make aircraft. Its matte finish is anti-glare, thus apart from looking good, this sight will not reflect away your location. 3 MOA Red dot: This dot is visible, and the intensity of its red color can be adjusted, making it visible in varying light conditions. The Vortex Razor Red dot sight has everything you need from a red dot sight. The Vortex Red dot I tested performed very well. In fact, I would rank its performance with that of pricier models such as the Trijicon RMR. Thus, it is a great sight that will survive almost any kind of weather it encounters. No list of the best reflex sight would be complete without the EOTech 512.A65 Tactical Holographic sight. After all, this is the sight you will find attached to most people’s weapons and for good reasons. I recently got to test this popular Holographic sight, and I have to say, I can understand why it is the go-to sight for many. My first impressions of it are that it is very easy to mount and looks very well made. I was also impressed with its field of view. Looking through the sight made me realized that its field of view was wider than of most sights I have used. And unlike other sights, this one is powered by two AA batteries that give you 1000 hours of use. Passive field of view: Apart from being wider than the field of view of most red dot sights, the field of view on this sight is also passive. This means there is no light emitted, which helps ensure you are invisible to your prey. 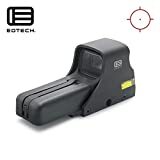 The many people who use this EOTech sight will confess that it is one of the best and easiest to use. More importantly, it is not priced in the same way as most EOTech sights. Therefore, you get the same quality that EOTech is known for at a reasonable price. And while it is not as affordable as others on this list, it is still worth its price tag. Sightmark is known for producing affordable optics, and the Ultra Shot Pro Spec Sight is no exception. And it is, for this reason, I decided to buy myself the Ultra Shot Pro Spec. Its affordability aside, this reflex sight is a very good sight. To start with it comes with multiple brightness settings, which I find to be very useful. In addition to this, it did not take me long to mount it on my rifle. And neither did I have any troubles zeroing the sight. Basically, this sight proved to be the best reflex sight under 150. Its price and features earn it a place on my list. Reticle with 4 patterns: This unique reticle gives you a variety of customization options to choose from. While there is no denying its 25 hours of battery life could do with some improvement, this sightmark sight is still a great sight for its price. Furthermore, I believe that it performed better than some other sights in its price point. Therefore, it is well worth it. Though it is labeled a riflescope, the amazingly affordable Bushnell Trophy TRS-25 red dot sight qualifies as a reflex sight. To some, it is the best reflex sight under 100, a feeling I am inclined to agree with after testing this red dot sight myself. Do not let its small size fool you as it can serve you well. What really surprised me about this sight is its glass quality. While it cannot match that of pricier models, the images appear clear and sharp for a sight in its price range. And I was even more surprised with its performance when I attached to a .308 autoloader. I was curious to see if it could handle the recoil. And as you might have guessed it maintained its zero, which was impressive. 3 MOA Dot reticles: The red dot on this sight is clear and has no distortions. Thus you will not have any trouble aiming at targets. 1X magnification: The magnification ensures you get a clear picture of your target without the field of view being interfered with. For anyone looking for a reflex sight that does not attract the hefty price tag of most sights, the Bushnell Trophy is the sight for them. Though it is not without flaws, it performs great for a sight of its price tag. There are many types of reflex sight out there and some scopes that are advertised as reflex sights. 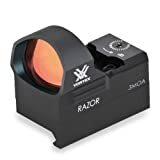 This review will be useful to avoid the misfortune of buying a normal scope masquerading as a reflex sight.The sights on this list have what it takes to be the best reflex sight or the best reflex sight for shotgun. Therefore, it is my hope that this article has been of use to you.